A place like Columbus seldom catches our fancy because few of us are aware of the real America, and even fewer know the contribution of Columbus towards the scientific and technological progress of Uncle Sam. So a visit to this capital town of Ohio province in the USA can be a very pleasant experience. “Columbus is a town in which almost anything is likely to happen and in which almost everything has,” said 19th century author James Thurber of his birthplace. If Thurber, a famous native son and humorist from Columbus, were alive he would not have been surprised to find the city on the cutting edge of scientific and technological progress. 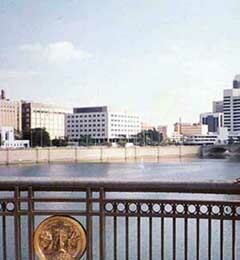 Columbus is not just the capital of the state of Ohio in the USA but it is a capital of state of the art. 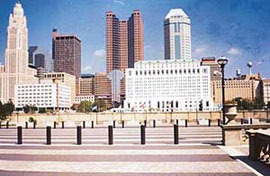 From a cowtown it has become the wow town of America with extremely well-kept roads, flower beds, a few elegant skyscrapers, Scioto riverfront and COSI, a first hand science learning museum. This city continues to lead the way to the future. State of the art is synonymous with Columbus, which ranks with Washington, D.C., as a center for scientific and technological information; more than 150 high-tech companies are in Columbus. These businesses made Columbus one of the first areas offering citywide cable television and introduced such technology as the 24-hour banking machine, interactive cable television and the electronic newspaper. The city also is a centre for retail banking, insurance and real estate, and it has emerged as a leading convention city. Columbus’ residents make up a demographically representative slice of America, making its main distinction the fact that it is not too distinctive. Columbus offers a perfect cross section of consumers for the testing of new products. Because so many fast-food chains develop their menus in Columbus, the city is often referred to as “Test Market, USA” Ordinary and extraordinary, the city has never looked back since shedding the industrial tradition of the Northeast. Despite Columbus’ growth to big-city status, driving in and around the city is not as hectic as in many metropolitan areas. Driving from one end of downtown to the opposite end averages 25 minutes, and few suburban commutes take more than 45 minutes at non-peak traffic hours. Of the famous places to visit in Columbus, Columbus Museum of Art is one. The Ferdinand Howard Collection of early modernist paintings, the Frederick Schuman Collection of Old Masters besides a good collection of impressionist, post-impressionist and expressionist works are a feast for the art lovers’ eyes. The museum has a sparkling sculpture garden and a continuing programme of travelling exhibitions. For the wildlife lovers, Columbus Museum too has a lot to offer. The first gorilla born in captivity was here while it has the largest collection of reptiles. A visit to Ohio Statehouse offers you some of the best examples of Doric architecture in the United States. This 1861 building contains historical documents, portraits and other works of Ohio’s noted governors and US presidents. Also visit The Thurber House, a restored 19th century building containing the memorabilia and drawings of author, humorist, cartoonist and playwright James Thurber, one of the most famous sons of Columbus. At Battelle Park in the heart of Columbus by the river Scioto don’t miss The Santa Maria. 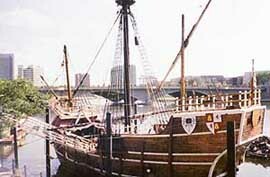 This is a full-scale replica of the 15th century cargo vessel that served as Christopher Columbus’ flagship during his historical journey to America. A 45-minute guided tour of the ship led by costumed docents highlights the challenges and hardships faced by Columbus and his crew. But a must visit for a traveller to Columbus is COSI Columbus. Billed as the fascination destination, COSI Columbus is an unusual structure that contains a hands-on science learning experience. Four floors of more than 1000 interactive exhibitions explore the sciences—health and life, history and earth, and physical science and technology. Here you can ride the high-wire cycle 20 feet above the ground, lift a car by using a giant lever, get a charge from an electrostatic generator and watch rats play basketball. While you can enjoy the thrill taking a free ride on the GeneRotor and test the power of centripetal force as you are spun at high speed and the floor drops out leaving you almost screaming in the air, at the dome theatre you explore the mysteries of the universe and beyond. Also don’t forget to take a break at the Atomic Café and enjoy pizza, sandwiches, salad, fresh fruits and desserts. If you are hankering for greenery at Columbus then be your own guide along Hoover Rservoir Nature Preserve’s wetland trails. One of them, the Olentangy Nature trail, running alongside the river of the same name, is an unpaved path perfect for walking, biking and jogging. Also Inniswood Metro Garden, part of a system of 11 metropolitan parks and natural areas, has more than 2000 species of flora. Then east of downtown, the towering old trees of Franklin Park give shelter to a variety of calmer and outdoor pleasure. At the German Village in Columbus, originally established by German-speaking settlers in 1800s, visitors can enjoy strolling through a district of 19th century houses, shops and restaurants.